George Washington De Long (22 August 1844 – c. 31 October 1881) was a United States Navy officer and explorer who led the ill-fated Jeannette Expedition of 1879–1881, in search of the Open Polar Sea. Born in New York City, he was educated at the United States Naval Academy and graduated in 1865. In 1879, backed by James Gordon Bennett Jr.—owner of the New York Herald—and under the auspices of the US Navy, Lieutenant Commander De Long sailed from San Francisco on the ship USS Jeannette with a plan to find a way to the North Pole via the Bering Strait. As well as collecting scientific data and animal specimens, De Long discovered three islands and claimed them for the United States in the summer of 1881. The US government did not endorse this claim; as such the islands are under Russian jurisdiction. The ship became trapped in the ice pack in the Chukchi Sea northeast of Wrangel Island in September 1879. It drifted in the ice pack in a northwesterly direction until it was crushed in the shifting ice and sank on 12 June 1881, in the East Siberian Sea. De Long and his crew then traversed the ice pack to try to reach Siberia pulling three small boats. After reaching open water on September 11 they became separated and one boat—commanded by Executive Officer Charles W. Chipp—was lost; no trace of it was ever found. De Long's own boat reached land, but only two men sent ahead for aid survived. The third boat, under the command of Chief Engineer George W. Melville, reached the Lena Delta and its crew were rescued. De Long died of starvation near Matvay Hut, Yakutia. Melville returned a few months later and found the bodies of De Long and his boat crew. Overall, the doomed voyage took the lives of 20 expedition members, as well as additional men lost during the search operations. De Long's death – and that of the other men – was assumed to have occurred at or about the end of October. In 1890, the officers and men of the US Navy dedicated the Jeannette Monument, a granite-and-marble monument designed by George P. Colvocoresses—a cross with carved icicles hanging from it that sits atop a cairn. The 24-foot (7.3 m)-high structure is in the US Naval Academy Cemetery overlooking the Severn River. Three US Navy ships have been named USS DeLong. In addition to the De Long Islands, the De Long Mountains in northwest Alaska and the De Long Fjord in Greenland bear his name. ^ a b c d Sides 2015. Danenhower, J. W. (1882). Lieutenant Danenhower's Narrative of the Jeannette. Boston: James R. Osgood & Co. ISBN 9781293958391. De Long, E. W. (1938). Explorer's Wife. Introduction by Vilhjalmur Stefansson. New York: Dodd, Mead & Co. ISBN 9781406764482. De Long, G. W. (1884). The Voyage of the Jeannette: The Ship and Ice Journals of George W. De Long. Boston: Houghton Mifflin. ISBN 9781108050197. Ellsberg, E. (1938). Hell on Ice: the Saga of the Jeannette. New York: Dodd, Mead & Co. ISBN 9781530797615. Guttridge, G. F. (1986). Icebound: the Jeannette Expedition's quest for the North Pole. Annapolis: Naval Institute Press. ISBN 9780870213304. Melville, G. W. (1885). In the Lena Delta: A Narrative. London: Longmans, Green & Co. ISBN 9781290871273. Muir, J. (1917). 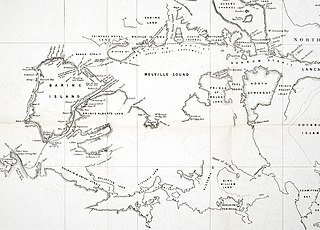 The Cruise of the Corwin: Journal of the Arctic Expedition of 1881. Boston: Houghton Mifflin. ISBN 9781941821114. Robinson, M. F. (2006). The Coldest Crucible: Arctic Exploration and American Culture. University of Chicago Press. ISBN 9780226721842. Sides, H. (2015). In the Kingdom of Ice: The Grand and Terrible Polar Voyage of the U.S.S. Jeannette. London: Oneworld. ISBN 9781780745213. USS Rodgers was a steamship in the United States Navy acquired to search for Jeannette in 1881.